The pattern includes two variations: A loose-fitting blouse and a relaxed tunic dress. Both variations have a concealed button closure and an uneven hemline. The blouse has a trench coat-inspired cape, and straps with D-rings at the sleeve openings. 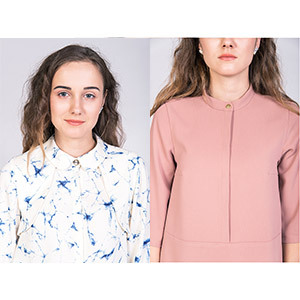 The blouse also has a rounded shirt collar and vents at the sides. The tunic dress has half-sleeves, a stand-up collar and a curved dolphin hem. 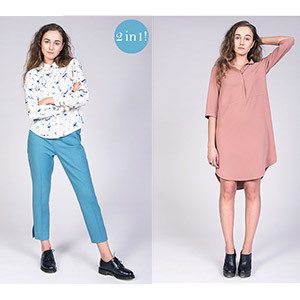 Suggested fabrics are cotton jersey, specialty woven, shirting, or linen.